Take tools and supplies to the job site inside this dependable work center. Three-duplex outlet, surge protected power strip with a 15-amp power rating and a 15' cord allows you to plug in tools when you get there. Constructed of rust-, dent, and chip-resistant structural foam. Lock secures all storage compartments. 36"W x 24"D cabinet has two adjustable 25-lb. cap. shelves. 40-lb. 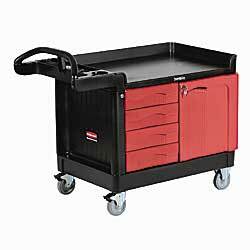 capacity drawers are 24"L x 13.25"W x 4.12"H. Non-marking 5" casters, 2 fixed, 2 with total lock brakes. Ships unassembled. IN STOCK. XA-5220 57	 Two doors	 500	 18-1/4" x 41-5/8" x 38-3/8"
XA-5221 87	 Four drawers	 500	 18-3/8" x 40-5/8" x 38-3/8"
XA-5222 84	 Two doors	 750	 26-1/4" x 49" x 38-1/4"
XA-5223 123	 Four drawers/one door	 750	 26-1/4" x 49" x 38"